I don’t have an objective overview of Black Sunday. I didn’t have any agent; I’ve never had an agent. Barbara Steele is an English film actress. She is best known for starring in Italian gothic horror films of the 1960s. Her breakthrough role came in Italian director Mario Bava's Black Sunday 1960, now hailed as a classic. Steele starred in a string of horror films, including The Horrible Dr. Hichcock 1962, The Ghost directed by Riccardo Freda, and Roger Corman's 1961 adaptation of Edgar Allan Poe's short story The Pit and the Pendulum, among others. 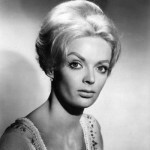 She guested on various British television shows including the spy drama Danger Man starring Patrick McGoohan. She took the role of Julia Hoffman in the 1991 revival of the 1960s TV series Dark Shadows. In 2010, she was a guest star in the Dark Shadows audio drama The Night Whispers. In 2010, actor-writer Mark Gatiss interviewed Steele about her role in Black Sunday 1960 for his BBC documentary series A History of Horror.